Black Cottonwood This tree is ‘Mountain Grown’ at Alpha Nursery and is an ‘Idaho Preferred’ Plant. shade, windbreaks and to create wildlife areas. 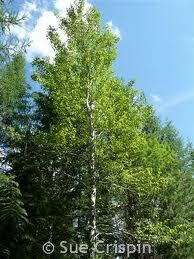 Its dark green leaves contrast beautifully with its white trunk. This tree will become more drought tolerant once it is established. The leaf buds and the young leaves have a pleasing fragrance of balsam. The fragrance is especially pronounced as the leaves unfold in spring and attracts bees. Will preform best in full sun to lite shade.